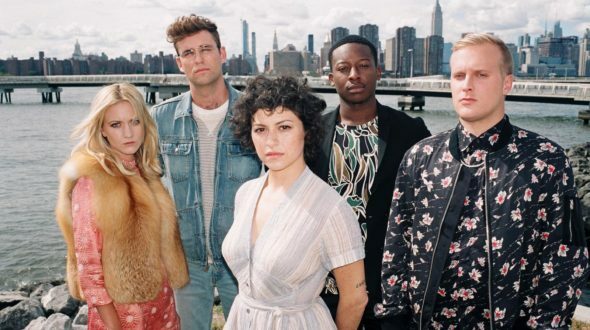 Performers include: Alia Shawkat, John Reynolds, John Early, Meredith Hagner, and Brandon Micheal Hall. This dark comedy TV series revolves around five self-absorbed twenty-somethings who become entangled in an ominous mystery. Dory (Alia Shawkat) is a fragile and frustrated life-long doormat who’s not particularly proud of her impact on the world — especially since her greatest accomplishment to date is organizing clothes to be donated to Goodwill for her wealthy employer. She feels stuck in a stale and disconnected relationship with her boyfriend, Drew (John Reynolds). He’s a kind of clueless, complacent, spoon-fed doofus who just really loves Christmas. Dory also feels removed from her closest friends. Elliott (John Early) is a self-diagnosed narcissist who loves adding job titles to his designer-stylist-curator multi-hyphenate lifestyle. Portia (Meredith Hagner) is an actress who’s always struggling to balance the challenging demands of chronic insecurity and pathological self-absorption. Meanwhile, Julian (Brandon Micheal Hall) is Dory’s ex-boyfriend and a journalist who never stops looking for the truth, no matter whom it hurts. The story begins as Dory learns that Chantal, a girl she barely knew in college, has gone missing. Despite having almost no personal connection to her, Dory becomes fixated on the mystery. Dory, Drew, Elliott, and Portia are not crime solvers. They value brunch, parties, and their own loud opinions. So, when Dory drags them into a bumbling, perilous pursuit to find the missing girl, they soon learn the meaning of real danger and become entangled in a sinister plot that is more than their privileged Brooklyn lifestyles ever bargained for. What do you think? Do you like the Search Party TV show on TBS? Do you think it should be cancelled or renewed for another season? I love Search Party! I’m literally holding my breath to find out what happens to Doris! Please don’t cancel!!!!!!!! I would be delighted if this show got cancelled. It is an affront to my senses. I can’t stand watching the annoying and obnoxious characters be awkwardly unfunny in the clips I’m cruelly forced to see between other shows. Seriously LOVE this show…. great acting and plot… LOVE LOVE LOVE!!!!!!!! saw it by accident one night and loved it! have been trying to catch up on episodes i have missed. I absolutely love this show. I can’t wait for the second season!! The characters, the plot, and the dark humor are too interesting for only one season. It’s unlike any other show on t.v. Love it!!! The acting is superb, as well.